I was cruising thru the PBB vendor forum and came across an item that caught my attention. 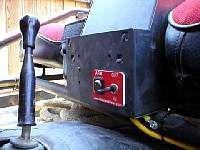 An in cab winch control kit. I know many of you are saying "So what!, I can make one of those myself" But... can you buy the switches & wires and fab a nice little backing plate for the low price of $29.95 that Roadless Gear sells this complete kit for? Me neither! So I went to their website and ordered one up. A couple of days later the unit showed up. Very nice setup! It came pre-wired with a set of easy to understand instructions with pictures. My only gripe was that it only came with 6 feet of wire, however they will supply as much as you need, within reason. 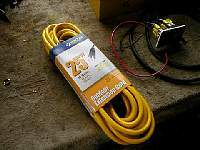 I simply bought a three wire 18 gauge extension cord for three bucks and used that. The first step was to figure out a place to put the controller. My dash was a little full, so we decided to mount the control unit to the front of my Tuffy console. 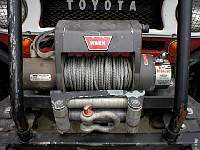 My winch is a Warn X8000i that's about 5 years old, so it is a three prong unit that is very basic. 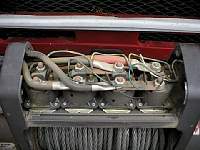 After removing the top cover of the winch, you can see the solenoids that we will be working with. 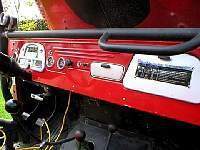 We started at the winch by drilling a hole in the side of the case, adding a grommet, pushing the cord thru and stripping it. We then routed the wire back to the center console. 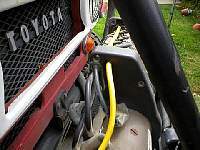 Next we connected the white wire from our extension cord to the "out" at the switch and to the correct solenoid on the winch. 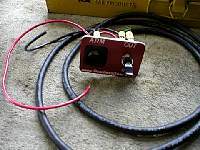 For my winch it was the first solenoid (A) in. 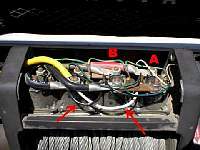 Then we did the same with the black wire to the "in" switch and the second solenoid (B). As upi can see in the pic, the white wire went to the green at the winch and the black went to the black. All that was left was adding power and ground to the switch, which we wired to only get power if the key was in the "on" position. All in all, this kit is a great product. It is awesome not having to fumble with digging for the remote in the toolbox, having to get out and plug it in, making sure you don't run over the cable, etc. Now I simply flip a switch and start winching!